Petromyzon marinus (sea lamprey) is an anadromous, eel-like fish that parasitically attaches and feeds on healthy fish. Petromyzon marinus is native to the east coast of the USA and the majority of the European coast but has been introduced to the Great Lakes through the canal system. Petromyzon marinus have contributed to the collapse of commercial fisheries and the extinction of three native species of cisco. Eel-like jawless fish with cartilaginous skeleton. No scales and no paired fins. Gray-blue back, metallic violet on sides, shading to silver-white underneath, skin is often marbled. Length 12-20 inches, weight 8-13 ounces. Radical metamorphosis of ammocoete larvae in freshwater. After metamorphosis, lampreys migrate to sea or freshwater lakes. Used for human food consumption as a delicacy in parts of Europe. The larvae prefer soft sediment substrates in clear streams; parasitic phase is found in cool-water lakes. The sea lamprey spawn in freshwater rivers in running water. Fertilisation is external. Lampreys gather in small groups. Small and not yolky eggs are buried in spawning redds excavated in clean, hard bottoms (litophilous broodhiders). The parents die after spawning. Eggs laid are numerous (35,000 - 100,000). Larvae feed on microorganisms and detritus. The lake-phase feed parasitically on healthy fish including: ciscoes Coregonus spp., lake trout Salvelinus namaycush, walleye Stizostedion vitreum, white sucker Catostomus commersoni, longnose sucker Catostomus catostomus, redhorse Moxostoma spp., yellow perch Perca flavescens, rainbow trout Oncorhynchus mykiss, burbot Lota lota, channel catfish Ictalurus punctatus, northern pike Esox lucius, and common carp Cyprinus carpio. Larval lampreys used as bait in non-native areas.May have attached to boats going through canal system. Recommended citation: Global Invasive Species Database (2019) Species profile: Petromyzon marinus. Downloaded from http://www.iucngisd.org/gisd/species.php?sc=542 on 22-04-2019. 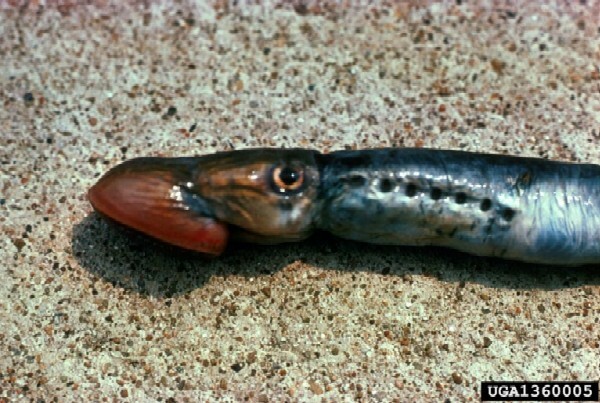 Lampreys attack and are parasite feeders on other fish, often resulting in the death of the fish. Partially responsible for collapse of commercial fisheries in the Great Lakes during 1940s-1950s. Decline of large native fish including, several ciscoes Coregonus spp., lake trout Salvelinus namaycush, and walleye Stizostedion vitreum. Partially responsible for the extinctions of 3 native species to the Great Lakes, longjaw cisco Coregonus alpenae, the deepwater cisco C. johannae, and the blackfin cisco C. nigripinnis. 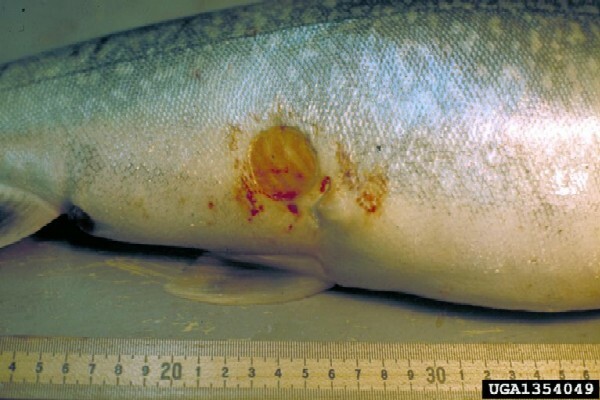 Because lamprey predation had reduced the number of large predators, the introduction of alewife (Alosa pseudoharengus) in the 1940's resulted in an explosion of the alewife population with serious consequences on distributions and abundances of native fish. 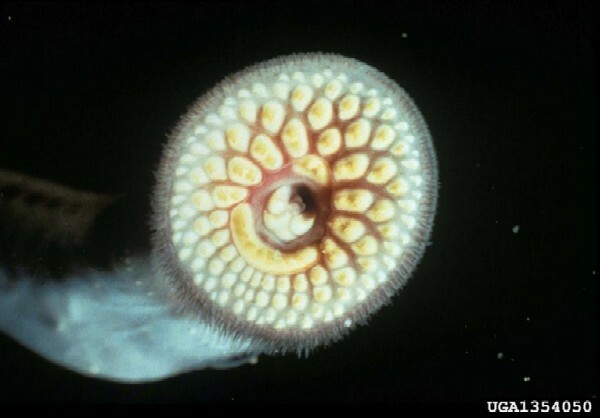 Lamprey also prey on introduced salmon that are valued by anglers in the Great Lakes. Chemical: In 1958, a lampricide, TFM, was developed that selectively kills lamprey larvae. Control options have included a bottom-release, granular lampricide application of Bayluscide. Physical: Efforts to bring lamprey populations under control have included: trapping and removing female lampreys, releasing large numbers of sterilized male lampreys. Informations on Petromyzon marinus has been recorded for the following locations. Click on the name for additional informations. Applegate, V. C. 1950. Natural history of the sea lamprey Petromyzon marinus in Michigan. U.S. Fish and Wildlife Service Special Scientific Report. 55:237 pages. FishBase, 2004. Species profile Petromyzon marinus Sea lamprey. Pam Fuller, Leo Nico and Erynn Maynard, 2004, Petromyzon marinus. Nonindigenous Aquatic Species Database, Gainesville, FL. Summary: General information on the distribution, dates and locations of introductions, and impacts of introductions.